At 3,000 feet and inland, Waimea enjoys some cooler temperatures than most of the Big Island. This area is reknown as the home of the Paniolo (Hawaiian cowboy) and hosts a Paniolo Parade on July 4. Several working cattle ranches in the area provide equestrians with the chance to enjoy horseback riding within view of the magnificent mountain views. Waimea’s proximity to the spectacular Waipi’o Valley, with its amazing waterfalls, makes Waimea the ideal location for hikers. Just down the road are stunning sugar-white beaches as well as some of the area’s rarer black sand beaches surrounded by towering cliffs, making for stunning scenery. Prospective residents will enjoy the small-town feel of Waimea while enjoying the amenities of a larger town: fine restaurants, a large shopping center along with boutiques and shops, theater, museums, art galleries, and cultural events such as the annual Waimea Cherry Blossom Festival and the Ukulele and Slack Key Guitar Festival. Single-family homes are available in Waimea, along with spectacular ranch properties. Prices start at $500,000. Land is also available for those who wish to build a custom home. 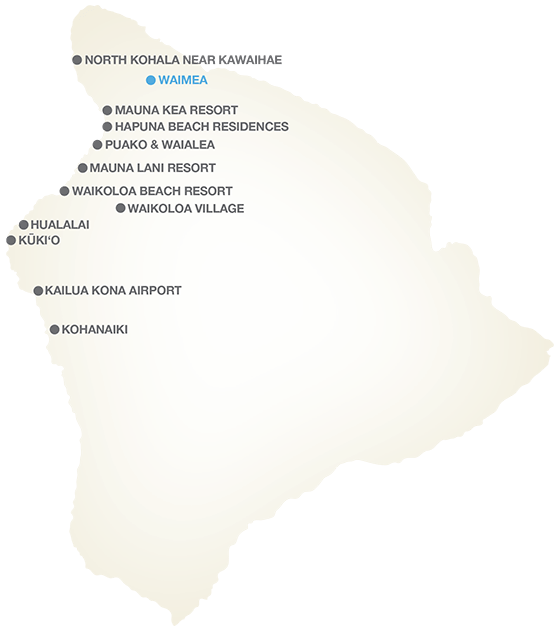 We are well known along the Kohala Coast for informed and experienced guidance—not only to buyers and sellers but to the development and investor communities as well. Strictly Necessary Cookie should be enabled at all times so that we may save your preferences for cookie settings.